Oil temperature control units circulate oil through the process and are used for applications were the required temperature ranges from 100° to 500°F. These units use a high flow pump to circulate high temperature oil through the process. A heater elevates the temperature of the oil. Cooling is provided through the use of an optional heat exchanger. Units are available with a variety of control instruments, heaters sizes, cooling heat exchanger sizes, and physical packages. This model is equipped with a cooling circuit. It has a high temperature water-to-oil heat exchanger to provide fluid cooling. The centrifugal pump has a water-cooled pump seal for extended seal life. 1. Since product innovation and improvement is our constant goal, all features and specifications are subject to change without notice or liability. Selection of certain optional features may change listed specifications. 2. Derate heater output by 25% for 208/3/60 operation. 3. Full load amps are higher than run load amps and must be used for sizing disconnects and supply wiring. Not for construction. Consult factory for power requirements of unit as configured and on selected options. 4. Consult factory for 50HZ operation. 5. Unit weight crated for shipment. 7. Do not use Multitherm 603. 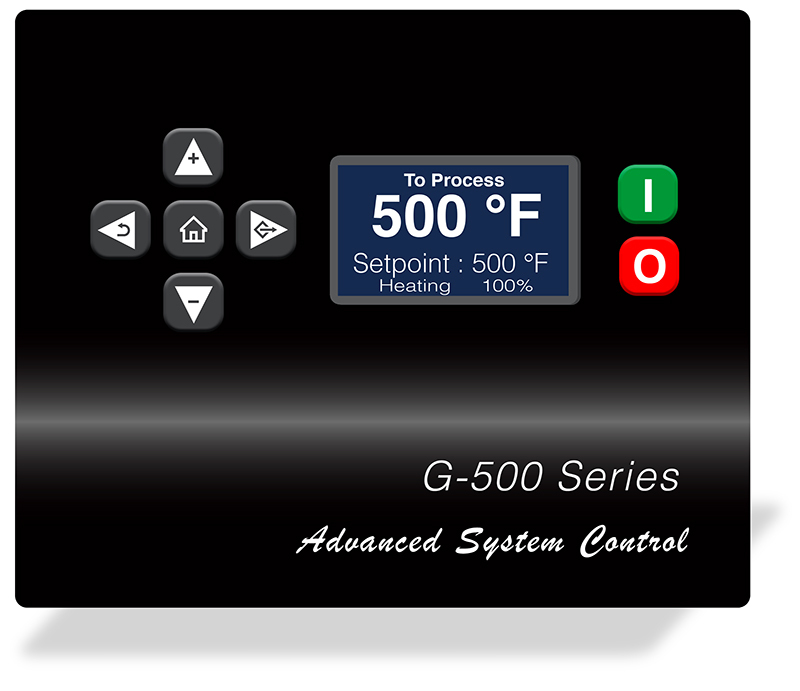 Home screen includes continuous set point and to process temperature. % Heating or Cooling indication on home screen. Out-of-spec alarm including standard audible signal. Selectable �F or �C temperature display. Selectable SPI or Modbus RTU communication.